Being a native San Franciscan, there are certain places in this city that I love, that hold special memories, that are magical to me. And then there are places in this fine city, the greatest city in the world … that I avoid at all costs. Ha! Fisherman’s Wharf is a place in San Francisco that you really must see if you come here for a visit. If you live here … eh. Lots of stores filled with cheap souvenirs, overpriced seafood joints, and the Wax Museum. That what I used to think of when I thought about Fisherman’s Wharf. Don’t get me wrong – there are awesome spots there – a Cable Car turnaround, Fisherman’s Grotto (San Francisco’s oldest restaurant – I just ate there for the first time this year! 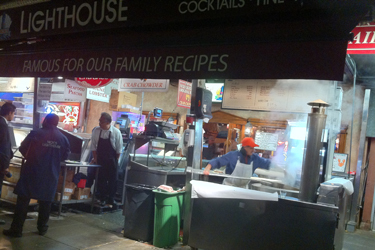 ), and a beautiful Boudin Bakery with with huge street facing windows where you can watch bakers at work. It’s just that when you live in a town that among other things, and is famous for tourism, you kind of tend to want to avoid “Tourist spots” because of the crowds, noise, and usually, overpriced things. Well, thanks to INDT last year and this year, our appreciation of Fisherman’s Wharf has grown. Last year, along with our adventures at the Wax Museum and on San Francisco’s Cable Cars, we got to go on a Duck Tour (they leave from the Wharf), we visited Hyde Street Pier, and we got to play at the Musee Mecanique in its new spot (it used to be at the Cliff House). There are lots of cool things that have been right in front of us all our lives, and we’d just never gotten to experience them before. 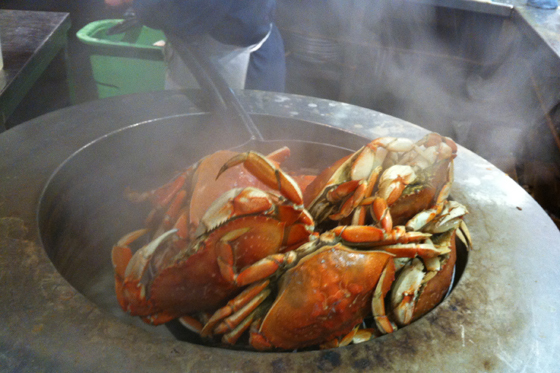 Another great thing in Fisherman’s Wharf that I’d never enjoyed before (since we’d never gone there often before) was a fresh boiled crab from a street stall. Well tonight, for Ryan’s birthday, we headed to the Wharf. 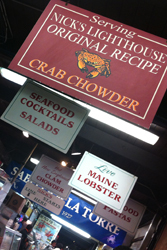 There are several different stalls to choose from – and the vendors all call to you and tell you their seafood is the best. The selection can be dizzying. We ended up choosing the stall affiliated with Nick’s Lighthouse, because they had a pile of lovely crabs on display, freshly prepared. We ordered a whole crab, a crab salad sandwich, and some crab chowder. They cut up our crab, served us our chowder, and made the crab salad for our sandwich, fresh. Awesome. 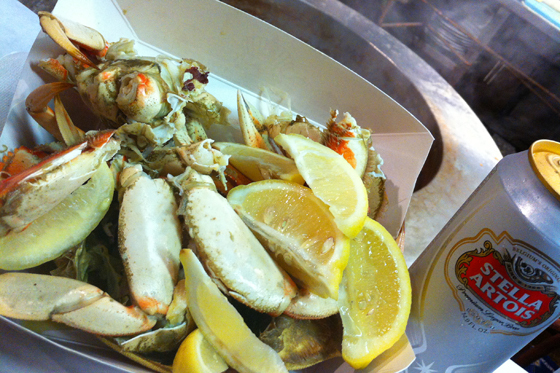 The crab was so fresh and so sweet. I could not believe how delicious it was. I seriously think it was the best crab I’ve ever had. When you get seafood from a stall affiliated with a restaurant, they’ll let you know if there’s room to sit inside, but we enjoyed the night air, even though it was sprinkling a bit. We stood at the booth, and ate and loved every bit of our food. It was just wonderful. 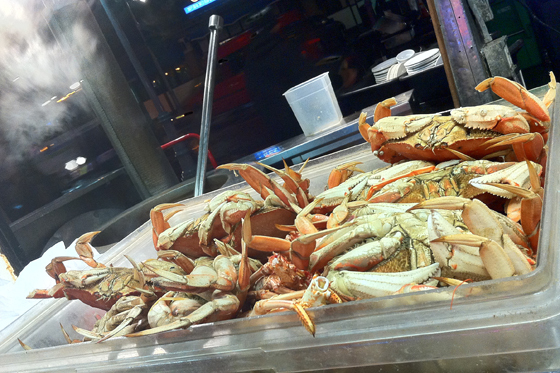 If you haven’t had fresh seafood from a stall at Fisherman’s Wharf yet, come and eat. There’s more than crab – there are so many choices – there’s something delicious no matter what kind of seafood you’re looking for. I’ll put my recommendation in for the booth by Nick’s Lighthouse. Best crab I’ve ever eaten.